Location: Duravel, in the Meurthe-et-Moselle departement of France (Lorraine Region). Notes: The Château Boutier is located boulevard Gustave Joubert, in the commune of Duravel, in the department of Lot.The wall of the garden is on the ancient ramparts of the city. 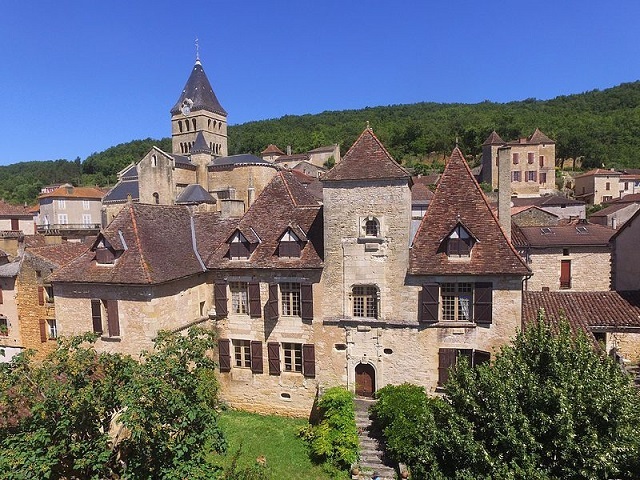 Shortly before 1596, the Boutier family, rich Protestant traders, acquired several buildings from the Duravel priory to build a new residence there.Boutier Castle is the result of this assembly from the end of the sixteenth century or the beginning of the seventeenth century. It has undergone several successive modifications as can be seen by looking on the facades the closed and open openings to make this assembly a coherent whole with a roof roof.The walls of the tower were raised in the nineteenth century.The castle has been listed as a historic monument since 16 September 1991.The Boutier castle is composed of a main building on either side of a central staircase tower with a wing in the west. It opens onto a large garden, enclosed to the south by a wall located at the edge of the city's ancient ramparts.The tower contains the staircase that serves all floors of the castle.